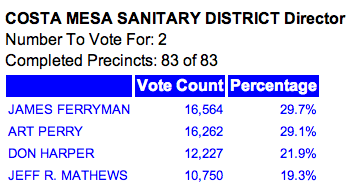 The big news here is that Gary Monahan moved further ahead of John Stevens. He stretched his lead over Stephens by 13 votes. 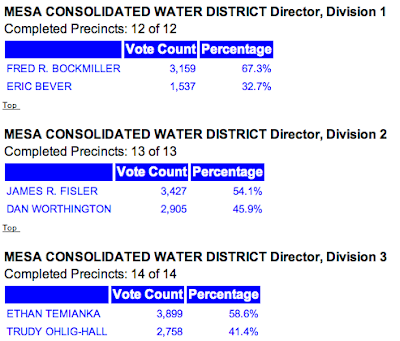 Sandra Genis held the lead and stretched it to 1820 votes over Steve Mensinger, who is 258 votes ahead of Monahan. Colin McCarthy trails Stephens by 468 votes. There are only 1,504 votes remaining to be counted. There remain only 1,827 votes remaining to be counted in these races. The incumbents cannot be caught. These races are over. If the trailing candidate received all the remaining votes they could still not overtake the leader in each of the three races. Crap. Come on John Stephans. I can't stand four more years of Gary Monahan. How can any self respecting Costa Mesan vote for him? I hope that Stephens will catch Monahan but doubt he can as Gary can go up it votes just as easy. Regardless of the final vote tally, I think Monahan needs to see he didn't win by mandate and did so by the slimmest margin. Like a worker who as been on the job for too many years and comes in work operating on auto pilot and simply rides out the clock ever work shift, Monahan's best and most productive days are long behind him. Gary is there to collect a check. He will never be Mayor again; instead takes a seat on the dais that could be better filled w/ an eager, energetic council member. 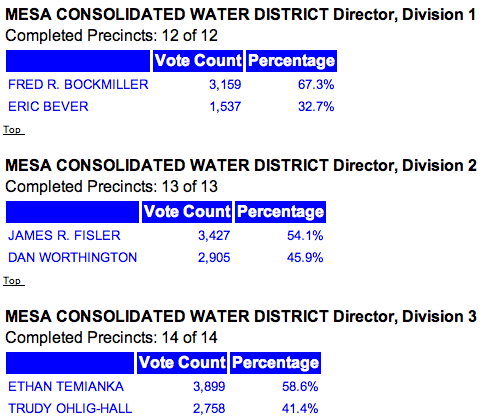 Council majority or not, Righeimer has failed in Costa Mesa and will be on his way soon enough. Considering that Gary has been keeping CMs city streets supplied with drunk drivers for years, now he'll get to take part in deconstructing the CMPD who has won awards for catching them. With our future Sheriffs dept patrol coverage, his customers will all be able to have one more for the road. Agreed Sam. The only good about him is that he will miss most meetings in order to serve beer at his bar, while drinking half of it. The only bad thing thing about him is that he will miss most of the meetings in order to serve beer at his bar, while drinking half of it. This will leave the council locked in tie votes unless he's there. Keeping my fingers crossed for John. 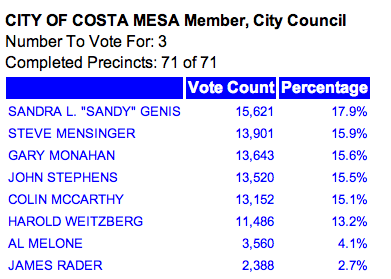 Congratulations to the residents of Costa Mesa who elected a leader to represent them. Gary is a local business owner, father of six kids of attend our schools. He should be proud he did not accept one dollar in union money. John Stephens has no connection to Costa Mesa. He works in Newport Beach, sends his kids to private school and hasn't done one thing in our City, accept hang out at the Mesa Verde Country Club. He simply woke up and decided to run for Council, and gladly accepted Police union money and Fire money (through the bogus "California Victory Fund" PAC.) He is as dirty as they come! "Stephens has no connection to Costa Mesa.."
Does Gary have health issues? More lies about Stephens. We're keeping track of all your lying. In the meantime, let Val know how many deals Fisler has cost the agency. yeah, let's get Fisler! He thinks different than us. Total fluke he won re election. Let's ruin his life as best we can and teach him to think correctly in the future. We will get our due respect sooner or later from him. He will think our way, you know, learn tolerance from us. We will get his mind straight eventually or at least send him to the poorhouse. Anyone up for a picket at his office? Unemployed at Christmas is the goal. Respect us! Why should we tax payers have to pay for medical insurance for Gary's family? He barely works 10 hours a month for the City of Costa Mesa. Why does he get health benefits and a pension when no other part-time employees get anything like that? He makes over $30,000 a year for a maybe 10-15 hour per month job. He even gets his medical when he does not show up to meetings. We got rid of Bever, Gary has to go too. Tustin was smart and eliminated benefits for elected officials. If Gary is such a "fiscal conservative" why does he continue to take these benefits? Righeimer has his office in Newport Beach and sends his kids to private school. No one should ever criticize a parents'choice for schools for thier kids. Criticizing someone, who has a successful career that allows him the options to chose the right education direction for his children, is just petty and whiny Stephans should be commended for paying his own way. @ Sam: You are highlighting the complete hypocrisy of the current "gang of M's"; they (along w/ Bever, Fitz, Colin, Ethan, and crew) like to demonize our City employees but NEVER ONCE offered to reduce or give up their pensions or their medical benefits. Monahan has outlived his usefulness and certainly is not earning the benefits that Costa Mesa residents are paying for! Fisler and people like him need to understand that if they attack our employees, especially public safety, and help spread lies, we will not do business with them. They are welcome to find customers elsewhere. No real estate deals for Fisler or his agency until he renounces the Righeimer agenda and apologizes to the people of Costa Mesa. You are both pieces of work. You advocate boycotting a local business with multiple employees because of one employee's political opinions? You mention public safety - are you cops? Firemen? Union trolls? You think trying to silence opposing viewpoints with blackmail, threats and boycotts is an acceptable tactic. You think that attacking someone's livlihood is acceptable payback for expressing political opinions. Stay anonymous, pals - you very well may just reap what you sow. Nice bit of economic terrorism there, Antonio.